The GBP/USD pair advanced up to 1.2940, but bulls lost the grip and the pair retreats from the level, despite tepid US data just released. Nevertheless, the pair holds above the 1.2900 level, favored by broad dollar’s weakness and ahead of PM Theresa May live Q&A event later today. The UK leader will participate in a Facebook event in where voters could ask her questions ahead of the election early June. Investors are on hold now when it comes to the pair, waiting for some clues over the upcoming Brexit, although seems unlikely she could add something new. 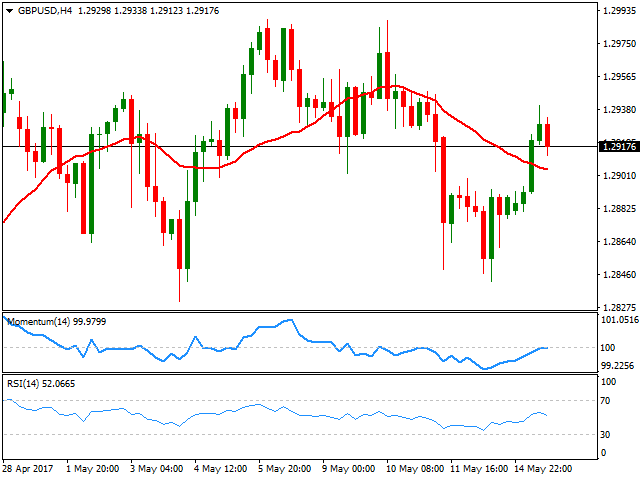 From a technical point of view, the 4 hours chart presents a neutral stance, as the price has recovered above an anyway bearish 20 SMA, whilst the Momentum indicator pared gains around its 100 level and the RSI indicator turned lower around 52, lacking enough strength to suggest a downward moves. Former highs in the 1.2880/90 region come as the immediate support, while multiple highs around 1.2950/60 are the resistance to beat to support an upward extension towards the critical 1.3000 figure.